In 79 AD, the eruption of Mt. Vesuvius covered Pompeii in ash, preserving the city for millennia. In 1969 AD, a fire broke out at the mansion of the famed Chosen Family commune north of San Francisco. Most of the possessions were left behind—providing archaeologists with a one-of-a-kind time capsule of hippie life. If you're a Grateful Dead fan, you're already familiar with the commune, which was founded at Olompali State Park in 1967. 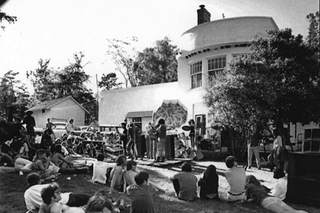 The band—one of many musical legends who played there—used a photograph of the bucolic commune as the back cover for their album, Aoxomoxoa. The Olompali commune started with around 30 members, and grew to a population of 50 to 70 people—aged 7 to 50—living in the 24-room Burdell Mansion and a couple of nearby structures. When a fire consumed the mansion on February 2, 1969, nobody was injured. Some members of the group remained on the property in an unattached frame house for a few months, but the commune officially closed in August. State archaeologist E. Breck Parkman began exploring the site as early as 1981, hoping to examine the historical realities behind what he believes are stereotypical notions about the commune and hippie life. But it would be decades before he could conduct a thorough excavation of the site, which was declared off-limits following the discovery of asbestos that needed to be cleared from the area. When Parkman was able to begin his excavation in earnest, he found a some surprises. Although the commune declared itself to be strictly vegetarian, he found lamb and steak bones. Parkman speculates that the new members who joined the community, particularly in its final year, were less concerned about the principles established by Olompali's founders. "Other intriguing items found were one unfired shotgun shell and one expended cartridge case," notes Parkman. "For a group of people normally associated with pacifism, the presence of a gun can come as a surprise; the group dynamics definitely changed when the commune became an open community in the last year, and the ownership of guns could be a reflection of this. Further research into the population of the commune shows that there were four military veterans living there at the time, three of whom had already served in the Vietnam War." But Parkman's real passion is music, and he's devoted considerable time and attention to the vinyl records left behind at Olompali. There is much diversity to be found in this commune of individuals, as seen by their eclectic collection of music. Everyone still had their own personal taste in music, and at least one of the founders was listening to jazz and show tunes, the type of music that might not be first expected from a member of a commune. This rather surprising hippie discography is already challenging preconceived notions about the hippie lifestyle….such a collection of music matches well with the multigenerational aspect of the commune. So, the next time a filmmaker portrays life in the late 1960s and uses the usual mix of counter-culture music as the soundtrack, they might consider adding some Judy Garland and Tony Bennett, for the sake of historical accuracy.